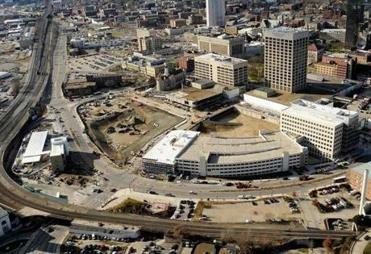 Worcester broke ground on the 20-acre, $565 million CitySquare project in 2010. Worcester’s downtown withered when city officials staked the neighborhood’s future on a silver bullet development that missed its mark badly. Now the city is redeveloping downtown, albeit at a pace that seems impossibly slow. But impatience misses two key points. The massive effort is advancing, even in the face of a weak real-estate market, and it’s advancing in the right direction. Worcester, once bedeviled by gimmicky real estate developments, is sticking to its plan and refusing to take shortcuts. Given the downtown neighborhood’s history, that’s the most important development of all. When developers broke ground on Worcester’s CitySquare project three years ago, the development was the largest post-urban renewal downtown redevelopment effort in Massachusetts history. The 20-acre, $565 million project involves demolishing a massive failed downtown mall, laying out a new street network, and constructing millions of square feet of offices, retail storefronts, and residential space. Worcester is trying to move beyond its failed downtown mall by creating something that is, in both physical form and philosophy, the antithesis of an urban shopping mall. Scores of American cities suffered from disinvestment and population loss in the 1960s and 1970s. Worcester wasn’t alone in throwing an expensive mega-project at its case of urban rot. But its results were especially disastrous. The city saw scores of shoppers abandoning downtown storefronts for suburban shopping malls, so it decided to drop a shopping mall in the middle of its downtown, sandwiched between city hall and the train station. The mall was an unmitigated disaster. It failed twice. Those failures became magnified, because Worcester had bulldozed a huge swath of its downtown and erased key roads to accommodate the mall. The city had cut its downtown in two, for a gimmick that didn’t even work. The city is currently working on rebuilding a downtown that looks and functions like one. It’s a turnaround plan that celebrates the downtown, instead of suburbanizing it. It recognizes that good downtowns start with people, and once downtowns fill with people, business happens organically. Ten years ago, Worcester’s downtown was going to hum. But today, the $565 million CitySquare project is still a far-off promise. CitySquare began with addition by subtraction. Construction crews demolished the old mall and much of the garage parking connected to it. They leveled 80,000 tons of concrete and rebuilt the street grid the mall had erased. The project developer, Leggat McCall Properties, built and opened a pair of commercial buildings, including a new headquarters for the insurance company Unum, in the midst of a poor development market. Plenty of work remains. Well over 1.5 million square feet of buildings remain on the drawing boards. The city needs every one of them to create a downtown that hums with life. 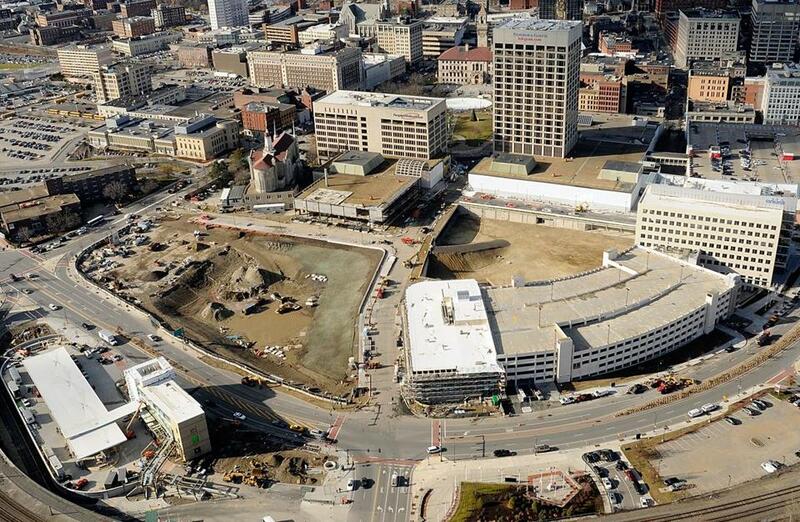 Worcester’s failed mall showed that cities can’t wish vibrant downtowns into existence. People need real reasons for coming, and staying, downtown. That’s why the residential component of Worcester’s CitySquare plan looms large — and why it shows the city understands the importance of incremental change. CitySquare needs around-the-clock residents to anchor Worcester’s new downtown, not just office workers who punch the clock before driving home. It needs a critical mass of bodies who are vested in the neighborhood, and who will attract the restaurants and coffee shops that will draw new visitors to the area that will allow the entire district to succeed. This critical mass needs to be large. The city needs sizable apartment and condominium complexes to deliver the number of bodies that will anchor the rest of the neighborhood. Sizeable residential buildings are also very difficult to build in Worcester, because they cost more to build than they’d generate in rent. Cheaper wood-frame apartments could have gone up a year or two ago, but these low-slung buildings wouldn’t generate anywhere close to the kind of residential density the CitySquare vision hinges on. It’s a sign that the city gets it, that it’s avoiding shortcuts and holding out for the kind of density it needs to create a downtown that isn’t just full of buildings, but actually feels alive.